I've been at university for two years exactly now. I feel like so much goes through my mind that I think surely others in university must think the same? I decided to come up with a new monthly or so series on thoughts I am currently having on university - some are the more serious thoughts like money - which I'll get into and others are more laughable. This is a thought that I think myself and many others constantly think about. University isn't the cheapest of things with 9k a year to pay for your course on top of any tuition fees and student finance you've applied for - it really does make you question whether it's all worth it or not. When I'd found out I'd been accepted into my chosen university I was pretty chuffed and proud of myself that all my college work had finally paid off but I really wasn't sure whether I'd be able to afford to go. It seems every year the cost of university just continues to rise and it really does make you question whether it's worth getting into all that debt for. I am personally so happy that I didn't let money put me off from going, I know it isn't that easy for everyone. I did struggle a lot with money in my first year of uni but that was pretty much due to me overspending too much - because I clearly needed to make use of all those supermarket 3 for 2 offers, ha. Money is something that I think we all think about long and hard before deciding to commit to university, as I mentioned earlier it isn't that easy for everyone to go. 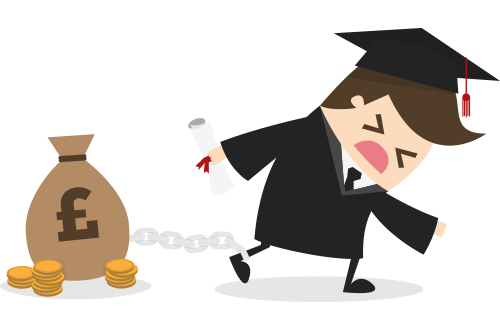 There are companies out there like Future Finance who look to help those looking to go into higher education who may have money matters without charging ridiculous rates. It's not a bad thing in the slightest to want to help yourself. Considering the fact that I've been at university for two years now, I feel like I've been pretty lazy in terms of getting involved in things. In my first year I got involved in articles for my university newspaper which I really enjoyed and was pretty proud of. I didn't do much else that I was really proud of after that but I personally feel like your first year is you getting involved in a few things but really just learning the ropes of university and not putting too much pressure on yourself. Although, I thought that the second year of university would be the one where I got involved in a lot.. but still no. The second year of university was a pretty tough one for different reasons but I just didn't seem to take up many of the wonderful opportunities that were available. I thankfully still have another two years to go before I hopefully graduate - so I don't have to dwell on the fact that I haven't really done as much as I would have liked to. This year I've decided to make a change and really get stuck into things like joining societies and taking opportunities that I can put on my CV and hopefully help with future employment. I think this is probably the most personal point out of all three mentioned. In my first year I really overdid it with drinking - it wasn't that I didn't have my limits or anything like that but I really made the most of going out and with every night out I'd have a drink. By the time it came round to second year I couldn't even hack alcohol anymore (aside from cocktails of course, ha) but the point I'm really trying to make it that it's not a bad thing to give up something that you are longer interested in whilst at university in fear of being judged. Do you agree with any of the points I've made? what are some of your thoughts?